What’s it like: This award-winning restaurant has long been established as one of the best fine dining options in Abu Dhabi, and with a new chef de cuisine at the helm, things are set to get even better. Sophisticated and intimate, the restaurant is French in every sense, from the understated, neutral colours scheme glammed up with chandeliers, to the Bordeaux landscape art adorning one wall. The view, of the winding waterways surrounding the hotel, is vintage Abu Dhabi though. Torn between trying the seven-course degustation menu, and the five-course blind tasting menu, my dining partner and I decided to opt for one of each. The meal is a culinary symphony displaying French finesse in each artfully presented dish, with subtle flavours and thoughtful interplay of textures, the apparent simplicity of each belying the complexity of technique that has gone into its creation – whether it’s the paper-thin scallop and salmon carpaccio marinated with citrus and chilli pepper, the melt-in-the-mouth braised veal cheek with baby carrots, or the delicious wagyu fillet served with shallot reduction and girolles mushrooms. The only blip on my radar would be the frogs’ legs with deep fried snails starter from the à la carte menu I opted to have instead of foie gras (trying to make a statement here! ), which, while nice, weren’t the best I’ve ever tried – of either delicacy. The five course menu followed a similar track, just skipping a course in between. Too full to do justice, I opted out of the cheese course (knowing fully well I’d live to regret it! ), but luckily my dessert was worth it. The Valhrona chocolate extravaganza – a chocolate ball encasing a scoop of ice cream with hot sauce poured over it table-side to melt it –offered a bit of culinary theatre with sinful indulgence. This restaurant definitely merits revisiting over and over again. 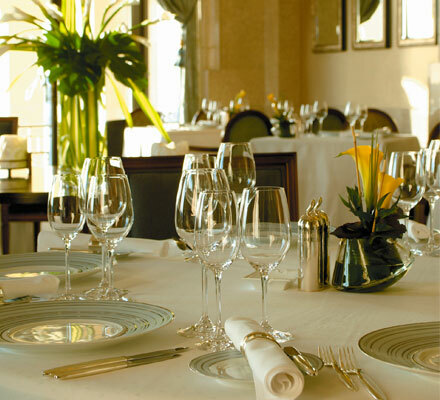 If you want to go: Seven-course degustation menu is Dhs625 per person; Five course blind tasting menu is Dhs500. Call 02-5098511.